View the Full Book Here! Interested in the history of New York's courthouses? Explore their stories county by county in this richly illustrated volume. 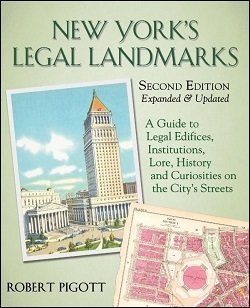 New York's Legal Landmarks takes you on a tour of Gotham through the eyes of a history-loving New York City lawyer. You'll visit courthouses past and present that were sites of sensational trials (both actual and in film), locations that figured in the nation's constitutional history, law firms where great Americans practiced law and the homes, schools and final resting places of Supreme Court Justices. Whether you want to stroll down the Lower East Side's Attorney Street or re-open the cold case of Judge Crater's disappearance, New York's Legal Landmarks is the guidebook for you. A tenement on Second Avenue called “The U.S. Senate”—an oblique reference to William Evarts, a Gilded Age New York City lawyer who served as U.S. Secretary of State, U.S. Attorney General and U.S. Senator. The location of the phantom New York City law practice of President Woodrow Wilson. The locations of the actual New York City law practices of Presidents Martin Van Buren and Chester Alan Arthur. The law office across the street from the old Tombs of the scoundrel law firm of Howe & Hummel. The Westside Court where W.C. Fields was tried in 1928 for an act of alleged animal cruelty committed during his vaudeville act at Earl Carroll’s Theater. The East 69th Street home of Ruth Bader Ginsburg, to which she invited her colleagues to celebrate a victory in one of the many public interest cases she litigated before ascending to the bench. The law office of a largely forgotten, early 20th century New York City lawyer, John Quinn, who was the subject of a Pulitzer-Prize-winning biography, not because of his legal career, but because of his connection to so many of the giants of the literary and art world of his day. A new Appendix X, which offers a treasure trove of 100-year-old photographs of courthouses included in a 1908 New York City publication inventorying its muncipal buildings. Robert Pigott has been practicing law in New York City for over 25 years, and, though he began walking at an unremarkable age, has been exploring its streets for over 50 years. A specialist in non-profit law, he has worked in private practice and the New York Attorney General's Charities Bureau, and he is now the general counsel of a 100-year-old New York City non-profit organization. He went to elemnentary and junior high schools in Queens, to high school on East 15th Street and to law school on West 116th Stree. He lives in Manhattan, one block from where he was born, with his wife and two children. Relying on extensive surviving original records, this book analyzes the November 1851 trial in the federal circuit court of Robert Morris, the second black admitted to practice in Massachusetts, for rescuing a fugitive slave from the custody of the U.S. marshal in the federal courtroom in Boston. 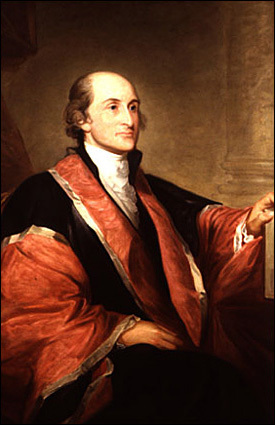 It demonstrates that Justice Benjamin Robbins Curtis, a supporter of Daniel Webster and the Fugitive Slave Act of 1850 presiding under a recess appointment, made two critical rulings against Morris that were at odds with existing precedents. 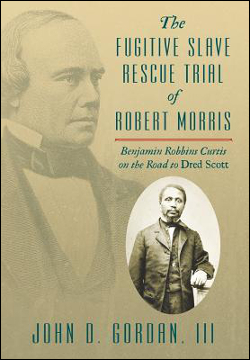 Finally, the book contextualizes Morris's trial among the other trials for this rescue, the prosecutions for the attempt to rescue Anthony Burns, another fugitive slave, in 1854, and the Supreme Court's decision in Dred Scott in 1857. This "small" book packs a large wallop. Gordan navigates the complexities of trial advocacy and trial procedure with unexcelled mastery. His analysis of the complex legal issues, including the power of the jury to rule on questions of law as well as fact, is persuasive. Gordan also throws a revisionist light on some of the major players - like John P. Hale who emerges from the wings as the real leader of the abolitionist bar; and Benjamin R. Curtis, whose manipulation of the law in the Morris trial illuminates his famous dissent in Dred Scott v. Sandford. A gem of a book. -- R. Kent Newmyer, University of Connecticut School of Law. A wonderfully detailed exposition of the fugitive slave rescue trial of Robert Morris, John Gordan's work unearths a wealth of material about the events, the people, and the legal acumen of the lawyers and judges involved. It will enable scholars to evaluate a question central to our judicial system: What is the proper division of authority between judge and jury? The information contained in Gordan's book provides a much-needed historically accurate basis from which to answer that question. -- Maeve Marcus, The George Washington University Law School. Society members are eligible for a 40% discount on this book. Check your email or Contact the Society for more information. Explores the influence of Dutch law and jurisprudence in colonial America. No society can function without laws, that set of established practices and expectations that guide the way people get along with one another and relate to ruling authorities. Although much has been written about the English roots of American law and jurisprudence, little attention has been paid until recently to the legacy left by the Dutch. 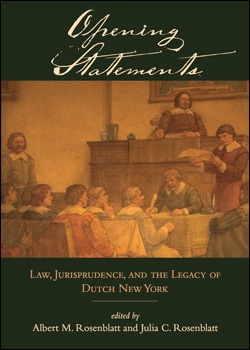 In Opening Statements, a broad spectrum of eminent scholars examine the legal heritage that New Netherland bequeathed to New York in the seventeenth century. Even after the transfer of the colony to England placed New York under English Common Law rather than Dutch Roman Law, the Dutch system of jurisprudence continued to influence evolving American concepts of governance, liberty, women's rights, and religious freedom in ways that still resonate in today's legal culture. Albert M. Rosenblatt is a Judge (Ret.) of the New York Court of Appeals, a Judicial Fellow at New York University, and of counsel to McCabe & Mack. His books include The Judges of the New York Court of Appeals: A Biographical History. Julia C. Rosenblatt is the coauthor (with Frederic H. Sonnenschmidt) of Dining with Sherlock Holmes: A Baker Street Cookbook. 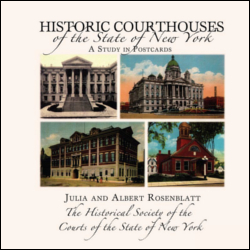 Together, the Rosenblatts coauthored Historic Courthouses of the State of New York: A Study in Postcards. This book can be purchased on the SUNY Press website or by calling 703-661-1575. This important reference work provides a comprehensive, authoritative guide to 160 years of the important legal legacy of the New York Court of Appeals, featuring original biographies of 106 chief and associate judges and hundreds of illustrations. Each entry features a full personal and professional biography as well as concise coverage of landmark cases, key opinions and a detailed context for understanding the legacy of each jurist. This book will be an essential resource for the New York legal community, scholars, students and practitioners of the law around the nation. This book may be purchased through Fordham University Press. The book retails for $150, but may be purchased for the special price of $87.50 plus $5.50 shipping and handling. CLICK THIS LINK, and use the Promo Code "Judg" at checkout. Courthouses have long served as the historical images for the counties in which they are built. Since the early 1900s, these monuments have been featured in historic picture postcards that served as inexpensive travel sourvenirs and today provide an accurate visual record of our past. This volume features rare postcard images of county courthouses throughout the state, along with a detailed narrative of notable trials and anecdotes, as well as the history of each county courthouse. Through this book, the reader will gain an appreciation for these great, public courthouses, and gain an understanding of how each community has changed over the years, and how things remain the same. The book may be purchased from the Society for $54.95, including shipping via USPS.